It’s rugby Brexit – but unlike the political nightmare, this is proving to be good news for Ireland. A clean European sweep may have marked the headlines of another worthy weekend in this stellar year for Irish rugby but scanning further down the page revealed another notable milestone. Just over a year since the IRFU ramped up their Exiles’ initiative in England, no fewer than six of that cohort starred in their respective provinces’ successes over the weekend. Ulster’s sparkling backline duo, Billy Burns and Will Addison, who conspired to create the try of the weekend from an Irish perspective, led the sextet. Munster’s bloodless victory over Castres included another commanding display from Mike Haley, whose quiet determination in a flourishing three-quarters has helped the deflect some of the disappointment following Simon Zebo’s exit. Johann van Graan’s men also introduced prop Ciaran Parker for his European debut, too. Meanwhile, in the stormy Sportsground citadel, Connacht fielded a mixture of the established international and callow fledgling in their easy win against Perpignan in Europe’s second tier. There, scrum-half James Mitchell and centre Kieran Joyce displayed commendable assuredness when offered their first chance to shine on a far bigger stage than they would have been used to. Neither looked out of place in a side that also included experienced Irish internationals Quinn Roux and Bundee Aki. All six players could have – and did – play for the Red Rose; now they are all embedded with the IRFU; indeed, many experts predict that the swashbuckling Addison may even make Joe Schmidt’s World Cup squad. For the former U-20 international, who played over 100 times in the Premiership for Sale, to complete such a rapid promotion would be startling. And, given Schmidt’s exacting standards, one would have to assume that rather being deemed surplus to requirements by England, his true qualities were never really appreciated there. Ironically, Ben Te’o once had a mind to pursue an Irish international career but, for financial reasons, re-routed to England. Given injuries to Robbie Henshaw and Chris Farrell, Addison may be in the mix to face England on the opening day of the Six Nations, when Te’o will be in English colours. It’s a delicious irony, particularly as England appear to be also lamenting the loss of their two former coaches, Andy Farrell and Stuart Lancaster, both of whom may yet be re-united in an Irish tracksuit after next year’s World Cup. Munster’s Haley has not enjoyed such a swift ascension as former team-mate Addison but he is still on Schmidt’s radar. 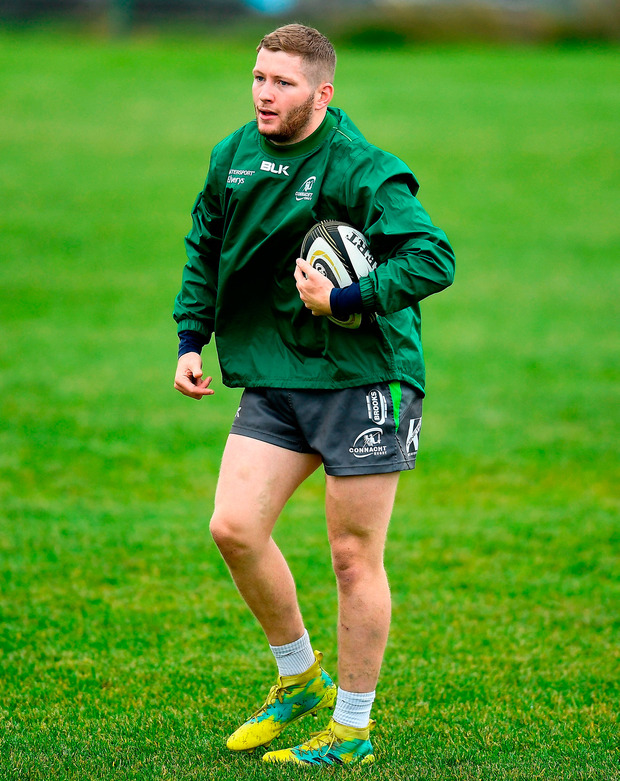 The 23-year-old played for the England Saxons twice in 2016 but remains Irish-qualified, through his Limerick family roots, due to those games having come against South Africa ‘A’ – who are not their union’s official second team. Interest Parker’s progress will be eyed with interest too. A native of Stockport who came through the academy at Sale Sharks, he made 12 appearances for the Aviva Premiership club. He was a member of the England team that won the U-20 Six Nations in 2015 and also played in the side that lost narrowly to New Zealand in the U-20 World Championship final in Italy later that year. Joe Lydon, ironically a decorated English rugby league player but now in charge of the IRFU’s Exiles programme, played a key role in engineering these moves to Munster. The Connacht duo also performed admirably in fiendish conditions last weekend. The 22-year-old Mitchell, from Maidstone in England is Irish-qualified through his maternal grandmother who hails from Enniskillen. He represented England at all age grades before being an ever-present in the entire Six Nations championship and that summer’s World Cup. Friend noted the contribution of Joyce in particular on Saturday. “He probably won’t get a tougher debut than that so fair play to him, he played 80 minutes,” said Friend after the Perpignan win. “He trained with us and played in the pre-season with us, and has been playing for Buccaneers. The bonus for Ireland is that there will be more of these players coming on stream in the months and years to come.